For those who visit Michigan for its natural beauty and scenic splendor, you're in the right place. But what do you do after the sun's gone down and even nature retires for the night? Ever consider taking in a little live music? 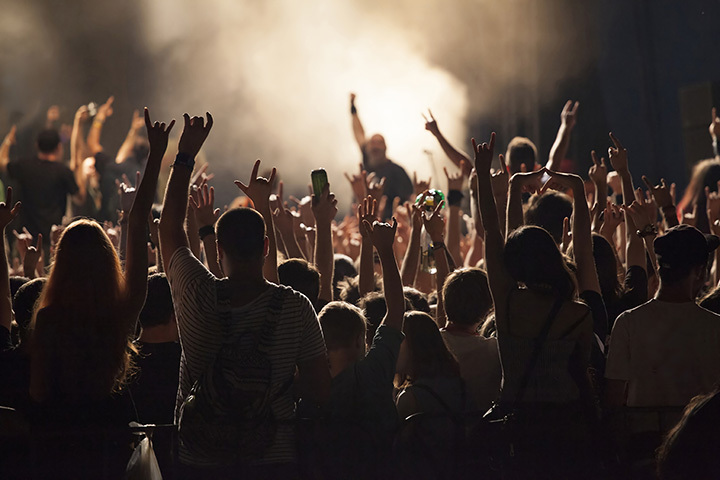 There are plenty of great live music venues in Michigan, both in large and small scales so those wanting a big blow-out concert can catch the extravaganza of their dreams while those wanting more intimate settings won't walk away unhappy. With that in mind, here are just 10 of those great live music venues in Michigan. It's impossible to make a list like this without talking about the massive DTE Music Energy Theatre in Clarkston. It's not only one of the largest such venues around, it's also one of the most heavily traveled venues in the United States. It's been ranked the most attended amphitheater 21 years running by Amusement Business/Billboard, clearly showing its worth being ranked on most any list like this. A venue whose season reportedly starts annually with an Eddie Money show is particularly noteworthy in its own right. Regarded in many ways as similar to DTE, though located in Sterling Heights, Freedom Hill is not only operated by the same firm that operates DTE Music Energy Theatre, but it also offers a similar amphitheater design. The difference between the two, however, is that Freedom Hill is really just a scaled-down version of DTE Music Energy Theatre. Complete with lawn seating and prices starting around $10 in some cases, Freedom Hill can be a great place for bargain hunters to catch live music without breaking the bank. Not all music venues in Michigan are massive stadiums, and one of the best non-massive venues around is Bell's Brewery's Eccentric Café in Kalamazoo. Famous for its craft beer, particularly its annual Oberon release, Bell's has multiple locations to its credit. At the Eccentric Café location, however, there's an added bonus of live musicians covering just about every type of music from funk to folk, and most everything else in between. Bell's Eccentric Café actually has music an average of three to four days a week, so it's a safe bet that someone's playing at Bell's. The Avenue Café hasn't been working in Lansing long, but it's delivering quite a bit of impact in the market. Not only is it offering a wide array of musical offerings, ranging from live metal bands to karaoke, but it's also got diversity in several other capacities. With the offerings of a live music venue intermingled with the offerings of a more standard cafe--including board game nights, free Wi-Fi, coffee and various vegetarian and even vegan dishes available- the Avenue Café makes versatility its watchword. With over 10,000 seats to its credit, Grand Rapids mainstay the Van Andel Arena features not only the best in live music-between now and the end of the year the site will host Kanye West and Stevie Nicks-but also in unusual events like Cirque du Soleil and the Kellogg's Tour of Gymnastics Champions. With all these events in place and plenty of seats to choose from, it's not surprising that this is one of the best places in the state to catch live music. Back in Kalamazoo, we get a look at an unexpected source of live music: The Kalamazoo Valley Museum. Actually, it's not so much the museum as it is a component of it, the Mary Jane Stryker Theater. While it offers monthly performances from the Kalamazoo Folklife Organization, its real claim to fame is the Fretboard Festival, an annual event that not only offers live music, but also workshops on stringed instruments and networking opportunities for future stringed instrument development. Arboretums aren't normally on people's mind when considering live music, but the Leila Arboretum in Battle Creek comes with a special added feature: the annual Leila Arboretum Music Festival, sometimes called Leilapalooza. Free for visitors-there's a fee for parking, but that gets funneled to the Kingman Museum and the Arboretum itself. Plus, the event comes with one special added attraction: The Beard Tent, in which the festival's best beards are publicly celebrated. It probably shouldn't be a surprise that one of the best music venues in Michigan is found near a college, but that's the case with Mac's Bar. Just a little west of Michigan State University in Lansing, Mac's Bar is the oldest music venue the city has to offer, and so bears a note of history with its live music. And live music it has in plenty. Mac's Bar has live music almost every night of the week, featuring such exotic acts as Agent Orange, Gil Mantera's Party Dream, and several others. Searching Google for Kenton, Michigan provides a close map with one point at its epicenter: Hoppy's Bar. This Upper Peninsula landmark has a second claim to fame to it as the best neighborhood bar in Michigan according to MLive's reckoning. Hoppy's delivers a surprisingly versatile package, renowned for its friendly atmosphere, its longevity-it's been around since 1946-and its food, like the massive Sloppy Burger. Just 45 minutes from Wisconsin, it's about as close to the edge of Michigan as can be but it's still uniquely, purely Michigan. The name says it all, as this Munising location offers not only coffee and books under one roof-generally regarded as a good combination-but it's also got a complete menu featuring specialties like a mixed berry smoothie and the wholly-Upper-Peninsula treat of smoked whitefish. Naturally, live music is also on hand to take an already-impressive picture in the Upper Peninsula to the next level. View more Michigan Live Music Venues.